Producers from America’s Got Talent have contacted South Florida’s Top Talent affiliates requesting names and contact information for past and present participants. “This is a fantastic opportunity for anyone who would like to showcase their talent,” states Connie Ramos-Williams of CONRIC PR & Marketing | Publishing. “It’s great to be able to watch our past and present participants receive more opportunities after auditioning for South Florida’s Top Talent!” adds Ramos-Williams. “We love to give everyone the opportunity to compete,” says Veronica Culbertson of the Southwest Florida Hispanic Chamber of Commerce. “It’s not too late to register for our last audition date. If you can’t attend, you may register by phone or email and send us a link to view your talent online,” adds Culbertson. The last opportunity to audition for the competition will be on Saturday, February 23, from 10 a.m. to 2 p.m. in the Dolphin Room at the Shell Factory & Nature Park located at 2787 N Tamiami Trail in North Fort Myers. Up to twenty winners will be selected from the auditions to advance and compete in the BIG Talent competition held in March. The Southwest Florida Hispanic Chamber of Commerce and CONRIC PR & Marketing | Publishing are hosting the South Florida’s Top Talent! Competition, which is sponsored by Pam Cronin of the Shell Factory and Nature Park. 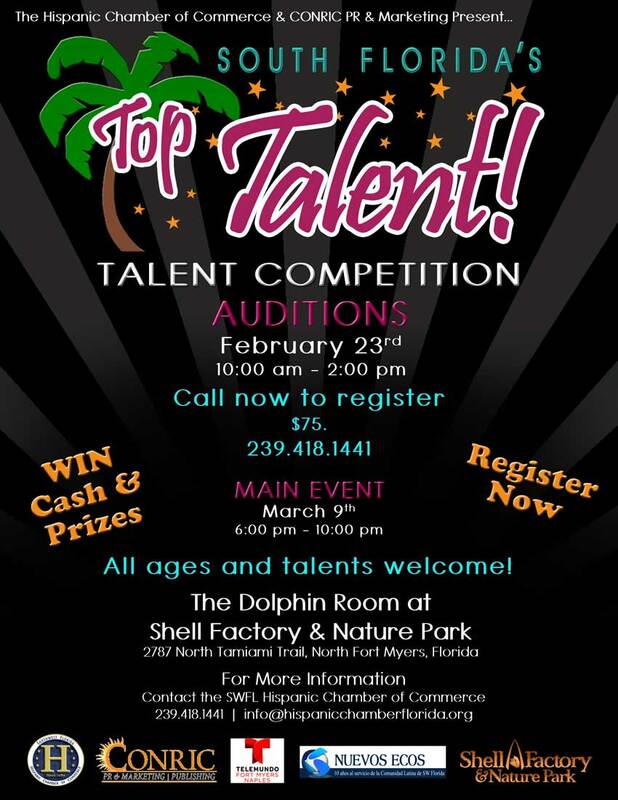 Singers, dancers, musicians, and entertainers with unique talents are all invited to audition and compete for the coveted South Florida’s Top Talent title. The competition will be broken up into two age groups, under 18 years old and 18 years old and up. A panel of celebrity judges will select the top ten winners in each age group. The twenty selected participants will then advance to compete in the South Florida’s Top Talent competition on Saturday, March 9th, from 6 p.m. to 11 p.m. at the Shell Factory and Nature Park in North Fort Myers. Judges will score each contestant on their overall performance and select a top winner in each age group. The winners will be announced that evening, and receive cash, prizes and publicity! “Many diverse talents were displayed during the first round of auditions,” says Connie Ramos-Williams of CONRIC PR & Marketing | Publishing. “I look forward to seeing more of South Florida’s talent at the final audition on February 23 and encourage everyone to register and compete for this fun and rewarding event,” adds Ramos-Williams. Guests are invited to attend the South Florida’s Top Talent competition on Saturday, March 9th. The fee to attend is $10, which includes admission, appetizers, meet & greet and talent show competition. There is a $75 registration fee to audition. To audition, become a sponsor or for more details, please call the Southwest Florida Hispanic Chamber of Commerce at 239.418.1441 or send an email to info@hispanicchamberflorida.org.